Please outline the current global cancer challenges. There have been significant inroads in our understanding of what drives cancer development, spread, and treatment resistance. Sophisticated diagnostic and profiling tools along with increasingly robust bioinformatics have adequately equipped cancer researchers and providers to start regarding cancers as heterogeneous entities where one size does not fit all. Unfortunately, these advances have only benefited resource rich areas. There exist vast regions throughout our globe where geographical, structural, and human capital constraints preclude even the basic cancer diagnostic and profiling processes we take for granted. These are not merely inconveniences; incorrect or delayed diagnoses can lead to fatalities. A case in point lies in cervical cancer where 80% of deaths worldwide occur in resource limited countries yet most of the advanced screening (e.g. Pap smear and/or HPV DNA testing) occurs in more affluent countries. Bridging the divide between the “haves” and “have nots” remains an unmet need. What features make smartphones a well-suited platform for point-of-care diagnostics? Smartphones are ubiquitous and intuitive devices with sophisticated capabilities; these merits support testing of their performance in the diagnostic space. Moreover, the portability, wireless data transmission, and relative ease-of-use afforded by smartphones enable the needed decentralization of health care to expand its reach into underserved communities. In addition to direct individual patient benefits, population level benefits can be achieved. To put this in perspective - if you took a photo on a trip abroad, the geotagging features of the smartphone can log both the time and location. Integrating such a feature into a diagnostic approach could help with improved epidemiological understanding of disease prevalence. Beyond addressing concerns of inaccurate cataloguing of cancers in resource-limited settings, better alignment of limited chemotherapy stockpiles can occur with those areas most in need. What technology can be used on smartphones to enable molecular diagnostics? A variety of technologies have been created by my group and other researchers world-wide to enhance smartphones for molecular diagnostics. Opportunities include fluorescence, holography, and electrochemistry among others. Each platform invariably has their pros and cons; as such, understanding the clinical need and local expertise and challenges could help identify the appropriate platforms over other less viable options for the intended application. It has recently been announced that you will be presenting in the “Wearable and point-of-care sensor technologies for biomonitoring” symposium at Pittcon 2018. Please can you outline your research in using smartphones to detect and profile cancer cells? Our work focuses on holography as well as contrast enhancement microscopy to achieve the needed signal-to-noise for reliable detection of our intended targets. Early iterations of smartphones as diagnostics within the field focused on its use as a microscope to provide more cost-effective and simple setups. Practically, that would still entail highly trained pathologists as the end user. But pathologists are scarce and overburdened in resource-limited countries. Moreover, two slides from two patients with the same cancer may look identical under the microscope, but the clinical trajectories could be quite different. 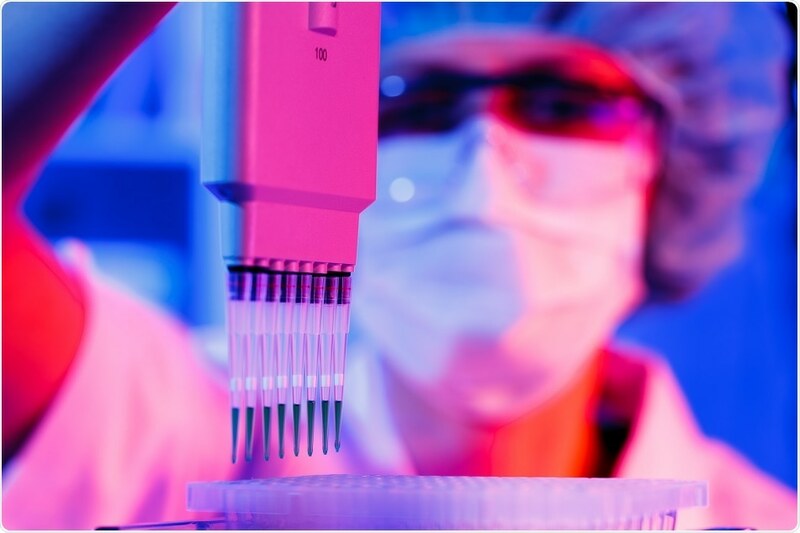 We thus focused on molecular profiling tumors to better gauge potential biological behavior in addition to improving diagnostics in a more automated manner. Our work has initially focused on lymphoma and breast cancers although other tumors can readily be analyzed. Through our smartphone approach, we regard them as vehicles for capturing data and transmitting them into the computing “cloud” where we’ve established a server that analyzes and reconstructs the data before sending a diagnostic result back to the phone within seconds. Please outline what is meant by the ‘shadows’ part of your “Highlighting Cancers Through Shadows and Smartphones” presentation at Pittcon 2018. The use of “shadows” is a play on the principle of holography. Much like hand “shadow puppets”, when light strikes an object, that light is redirected (or diffracted) at a particular angle. This creates a unique holographic pattern (shadow) that is inherently “noisy”. Our cloud algorithm reconstructs such noise into decipherable patterns allowing us to determine the presence or absence of cancer specific markers within a specimen. What is a holographic assessment and how can holographic technologies be used as a cancer screening tool? What measurements do they make about a patient? Let’s say we wanted to determine if a particular specimen contained estrogen receptors on the cell surfaces. This is important information to know in the breast cancer setting, since their presence would render the patient eligible for hormonal treatment. In sub-Saharan Africa, testing for hormonal markers is not routinely done or conducted in timely fashion in the few times it gets evaluated. In comparison, hormonal testing is invariably performed on specimens in the US. 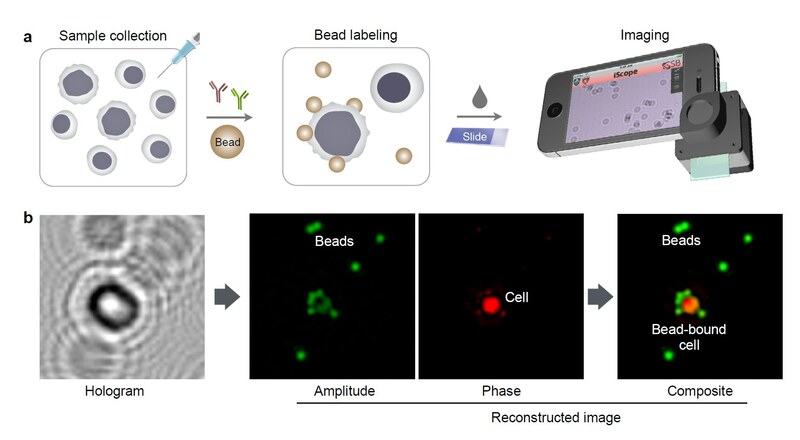 So, once our mobile platform is fully available abroad, we can place a sample of breast tissue on a small attachment that sits over the smartphone’s camera. We add small micrometer sized plastic beads that have estrogen receptor antibodies attached to their surface. If the specimen itself has estrogen receptor, the antibody (along with its attached plastic bead) would make a connection. We then shine the smartphone light on the specimen, creating holographic patterns. These patterns are sent to the cloud and reconstructed into the original cell and bead images. If there has been target engagement, then we would see a cell along with closely attached beads at predictable distances. If there is no target engagement (i.e. no estrogen receptor present) then we would see a haphazard arrangement of beads floating near or away from cells. Molecular detection with holography. (a) Schematic of holographic assay for cancer cells collected by fine needle aspiration. (b) A hologram image is reconstructed for complementary amplitude and phase contrast images. The amplitude (green) and phase contrast (red) images are pseudocolored for better visualization of cells and beads. The measurements can be multiplexed, meaning more markers can be evaluated to interrogate for the presence of certain markers of interest. The read outs can be achieved in an hour currently, which is a significant advance compared to conventional pathology interpretation (in resource rich regions) of a few days. How can holographic strategies be transferred to wearable devices? Wearable devices are indeed in their early days yet offer high promise for integration into clinical practices. In the case of a smart watch for example, a standalone device can be used to house and process specimens. The smart watch can be used to receive and store the read outs. Artificial intelligence algorithms are being developed by us to enable analyses without the need for cloud based testing in areas with limited or absent cellular service. Such algorithms would require less resource intensive computing; programs could potentially reside in smart watches or other wearables such as glasses. With other advances such as augmented reality, future possibilities and opportunities are even more exciting! What impact will your findings have on areas with limited medical access? The impact would be transformative. Exploiting point-of-care platforms that are user friendly, non-threatening, and cost effective would empower communities to develop sustainable diagnostic strategies. Diagnosing and understanding cancers before they spread are key windows of opportunities that can improve survival. What challenges are there to overcome in order for smartphones and wearable sensor technologies to be incorporated into standard care for cancer patients? While costs are advantageous compared to a laboratory setup with attendant skilled personnel, to truly enable wide spread adoption without concerns for resource allocation, each test would need to be cheaper than even one US dollar. Antibodies alone can be expensive. Appreciating these realities, we overcome this challenge through the use of small sized beads and scant specimen amounts (both requiring less antibody), and conversion of antibodies into powdered form for durability and room temperature storage (extending the expiration date of antibodies). With respects to the standard of care, my belief is that any innovation should align with existing clinical workflows and ideally increase the overall throughput of results. We think we have been making progress along these lines to the point that our work is positioned to be tested in Botswana later this year. What do you think the future holds for the Internet of Things and its role in personalized medicine? The connected world offers patients the opportunity to leverage powerful computing for clinical analyses. The use of artificial intelligence and machine learning can only enhance such opportunities through improved precision and prediction. As medicine becomes more decentralized, the burden of care will fall more and more on the patient. Through miniaturized devices, wearables, and sophisticated biosensors, there can be continuous interrogation of one’s physiology. Data can be transmitted to primary care physicians or specialists and algorithms can be devised or used to track disease, and truly personalized medicine can be achieved. Dr. Castro is Director of the Cancer Program at the Massachusetts General Hospital (MGH) Center for Systems Biology, Assistant Professor of Medicine at Harvard Medical School, and Attending Physician at the MGH Cancer Center. As a Regent’s Scholar, Dr. Castro attended the University of California - Berkeley leading to receipt of both Bachelor’s and Master’s degrees. 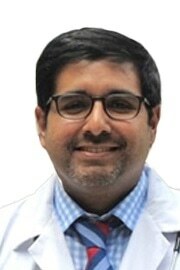 He attained his Medical Degree from the University of California - San Francisco (UCSF) where he also pursued Internal Medicine residency training. Dr. Castro completed a combined Adult Medical Oncology fellowship between the MGH and the Dana-Farber Cancer Institute in Boston. During this period, he also received a Master’s in Medical Sciences from Harvard Medical School while conducting post-doctoral research under Prof. Ralph Weissleder. Dr. Castro is a translational oncologist with experience developing and harnessing nanotechnology and molecular imaging platforms for cancer purposes. His work offers a “less is more” approach — to generate robust cancer analyses using scant amount of specimens. As such, his work with portable diagnostic platforms could also favorably impact resource-limited regions throughout the globe. Dr. Castro’s research has included funding from the V Foundation for Cancer Research, National Institutes of Health, Ovarian Cancer Research Fund, and the Department of Defense.